Although I’ve had a hard time finding Spanish women to cook with, the men are happy to show me their favorite dishes. Pedro owns a clean, well-lit bar in Vejer. He taught me how to make this hearty stew. Mix well. Add 4c sherry. Simmer until most of the alcohol has evaporated. 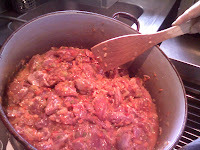 Then add enough water to cover the contents and simmer for 15-20 minutes, letting the liquid reduce. 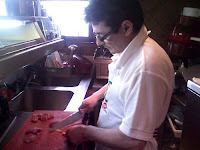 Add 5T tomato pulp (paste will do but making your own is better). Add 3T salt. Mix well. Simmer covered for 10-15 minutes. Enjoy!